processes, and plants provide a primary dietary source of these elements for animals and people. Micronutrient deficiency symptoms are often indistinct (“hidden hunger”) and commonly ascribed to other causes such as drought, extreme temperatures, soil pH, etc. The sporadic nature of distinct visual symptoms, except under severe deficiency conditions, has resulted in a reluctance of many producers to remediate micronutrient deficiency. Lost yield, reduced quality, and increased disease are the unfortunate consequences of untreated micronutrient deficiency. nutrients. Some of these changes are through direct toxicity of glyphosate while others are more indirect through changes in soil organisms important for nutrient access, availability, or plant uptake. Compensation for these effects on nutrition can maintain optimum crop production efficiency, maximize yield, improve disease resistance, increase nutritional value, and insure food and feed safety. conventional tillage to no-till or minimum tillage stimulated this conversion and the introduction of genetically modified crops tolerant to glyphosate. The introduction of genetically modified (Roundup Ready®) crops has greatly increased the volume and scope of glyphosate usage, and conversion of major segments of crop production to a monochemical herbicide strategy. glyphosate-tolerant crops such as soybean, corn, cotton, canola, sugar beets, and alfalfa; with their greatly increased application of glyphosate for simplified weed control, have intensified deficiencies of numerous essential micronutrients and some macronutrients. Additive nutrient inefficiency of the Roundup Ready® (RR) gene and glyphosate herbicide increase the need for micronutrient remediation, and established soil and tissue levels for nutrients considered sufficient for specific crop production may be inadequate indicators in a less nutrient efficient glyphosate weed management program. predisposition to disease. A basic consideration in this regard should be a much more judicious use of glyphosate. This paper is an update of information on nutrient and disease interactions affected by glyphosate and the RR gene(s), and includes recently published research in the European Journal of Agronomy and other international scientific publications. patented as such by Stauffer Chemical Co. in 1964 (U.S. Patent No. 3,160,632). Metal chelators are used extensively in agriculture to increase solubility or uptake of essential micronutrients that are essential for plant physiological processes. They are also used as herbicides and other biocides (nitrification inhibitors, fungicides, plant growth regulators, etc.) where they immobilize specific metal co-factors (Cu, Fe, Mn, Ni, Zn) essential for enzyme activity. In contrast to some compounds that chelate with a single or few metal species, glyphosate is a broadspectrum chelator with both macro and micronutrients (Ca, Mg, Cu, Fe, Mn, Ni, Zn). It is this strong, broadspectrum chelating ability that also makes glyphosate a broad-spectrum herbicide and a potent antimicrobial agent since the function of numerous essential enzymes is affected (Ganson and Jensen, 1988). Shikimate physiological pathway for secondary metabolism. This enzyme requires reduced FMN as a co-factor (catalyst) whose reduction requires manganese (Mn). Thus, by immobilizing Mn by chelation, glyphosate denies the availability of reduced FMN for the EPSPS enzyme. It also can affect up to 25 other plant enzymes that require Mn as a co-factor and numerous other enzymes in both primary and secondary metabolism that require other metal co-factors (Co, Cu,Fe, Mg, Ni, Zn). Several of these enzymes also function with Mn in the Shikimate pathway that is responsible for plant responses to stress and defense against pathogens (amino acids, hormones,lignin, phytoalexins, flavenoids, phenols, etc.). By inhibiting enzymes in the Shikimate pathway, a plant becomes highly susceptible to various ubiquitous soilborne pathogens (Fusarium, Pythium, Phytophthora, Rhizoctonia, etc.). It is this pathogenic activity that actually kills the plant as “the herbicidal mode of action” (Johal and Rahe, 1984; Levesque and Rahe, 1992, Johal and Huber, 2009). If glyphosate is not translocated to the roots because of stem boring insects or other disruption of the vascular system, aerial parts of the plant may be stunted, but it is not killed. treated plant residues. Degradation of glyphosate in most soils is slow or non-existent since it is not ‘biodegradable’ and is primarily by microbial co-metabolism when it does occur. Although glyphosate can be rapidly immobilized in soil (also spray tank mixtures, and plants) through chelation with various cat-ions (Ca, Mg, Cu, Fe, Mn, Ni, Zn), it is not readily degraded and can accumulate for years (in both soils and perennial plants). Very limited degradation may be a “safety” feature with glyphosate since most degradation products are toxic to normal as well as RR plants. Phosphorus fertilizers can desorb accumulated glyphosate that is immobilized in soil to damage and reduce the physiological efficiency of subsequent crops. Some of the observed affects of glyphosate are presented in table 1. TABLE 1. Some things we know about glyphosate influencing plant nutrition and disease. 3. Accumulates in meristematic tissues (root, shoot and reproductive) of normal and RR plants. 4. Inhibits EPSPS in the Shikimate metabolic pathway and many other plant essential enzymes. 5. Increases susceptibility to draught and disease. 6. Non-specific herbicidal activity (broad-spectrum weed control). 7. Some of the applied glyphosate is exuded from roots into soil. 8. Immobilized in soil by chelating with soil cat-ions (Ca, Co, Cu, Fe, Mg, Mn, Ni, Zn). 10. Desorbed from soil particles by phosphorus. 11. Toxic to soil organisms facilitating nutrient access, availability, or absorption of nutrients. 12. Inhibits the uptake and translocation of Fe, Mn, and Zn at non-herbicidal rates. 13. Stimulates soilborne pathogenic and other soil microbes reducing nutrient availability. 14. Reduces secondary cell wall formation and lignin. 16. Reduces Cu, Fe, K, Mg, Mn, and Zn in plant tissues and seed. 17. Residual soil activity can damage plants through root uptake. 18. Increases mycotoxins in stems, straw, grain, and fruit. 19. Reduces photosynthesis (CO2 fixation). 20. Accumulates in root nodules to chelate Ni and inhibit N-fixation in legumes. gene(s) that provide an alternate EPSPS pathway (EPSPS-II) that is not blocked by glyphosate. The purpose of these gene inserts is to provide herbicidal selectivity so glyphosate can be applied directly to these plants rather than only for preplant applications. As an additional physiological mechanism, activity of this duplicate pathway requires energy from the plant that could be used for yield. The RR genes are ‘silent’ in meristematic tissues where glyphosate accumulates so that these rapidly metabolizing tissues are not provided an active alternative EPSPS pathway to counter the physiological effects of glyphosate’s inhibition of EPSPS. The presence of the RR gene(s) reduces nutrient uptake and physiological efficiency and may account for some of the ‘yield drag’ reported for RR crops when compared with the ‘normal’ isolines from which they were derived. Reduced physiological efficiency from the RR gene is also reflected in reduced water use efficiencyWUE) and increased drought stress (table 2). functions for the life of the plant or until it is exuded through the roots. TABLE 2. Some things we know about the glyphosate-tolerance (RR) gene(s). 1. Provides selective herbicidal activity for glyphosate. 2. Inserts an alternative EPSPS pathway that is not sensitive to glyphosate action. 3. Reduces the plant’s physiological efficiency of Fe, Mn, Ni, Zn, etc. 4. Inactive (silent) in meristematic tissues (root and shoot tips, and reproductive tissues). 5. Reduces nutrient uptake and efficiency. 9. Transferred in pollen to plants and from degrading plant tissues to microbes. 11. Has greatly increased the application of glyphosate. availability of micronutrients in soil. Symptom remission indicates a resumption of physiological processes, but is not an indicator of plant nutrient sufficiency since micronutrient deficiencies are commonly referred to as ‘hidden hunger.’ As a strong nutrient chelator, glyphosate can reduce physiological efficiency by immobilizing elements required as components, co-factors or regulators of physiological functions at very low rates. Thus, plant uptake and or translocation of Fe, Mn and Zn are drastically reduced (up to 80 %) by commonly observed ‘drift’ rates of glyphosate (<1/40 the herbicidal rate). This is reflected in reduced physiological efficiency, lower mineral nutrient levels in vegetative and reproductive tissues, and increased susceptibility to disease. Microbial and plant production of siderophores and ferric reductase in root exudates under nutrient stress are inhibited by glyphosate to exacerbate plant nutrient stress common in low-available micronutrient soils. chelated with soil cat-ions. Degradation products of glyphosate are as damaging to RR crops as to non-RR crops. Persistence and accumulation of glyphosate in perennial plants, soil, and root meristems, can significantly reduce root growth and the development of nutrient absorptive tissue of RR as well as non-RR plants to further impair nutrient uptake and efficiency. Impaired root uptake not only reduces the availability of specific nutrients, but also affects the natural ability of plants to compensate for low levels of many other nutrients. Glyphosate also reduces nutrient uptake from soil indirectly through its toxicity to many soil microorganisms responsible for increasing the availability and access to nutrients through mineralization, reduction, symbiosis, etc. release accumulated glyphosate from meristematic tissues in toxic concentrations to plants. The most damaging time to plant wheat in ryegrass ‘burned down’ by glyphosate is two weeks after glyphosate application to correspond with the release of accumulated glyphosate from decomposing meristematic tissues. This is contrasted with the need to delay seeding of winter wheat for 2-3 weeks after a regular weed burn-down’ to permit time for immobilization of glyphosate from root exudates and direct application through chelation with soil cat-ions. The Roundup® label for Israel lists recommended waiting times before planting a susceptible crop on that soil. One of the benefits of crop rotation is an increased availability of nutrients for a subsequent crop in the rotation. The high level of available Mn (130 ppm) after a normal corn crop is not observed after glyphosate-treated RR corn. The lower nutrient availability after specific RR crop sequences may need to be compensated for through micronutrient application in order to optimize yield and reduce disease in a subsequent crop. Fe, Pseudomonads, Bacillus, etc. ), nitrogen-fixing organisms (Bradyrhizobium, Rhizobium), and organisms involved in the ‘natural’ (biological) control of diseases that reduce root uptake of nutrients. Although glyphosate contact with these organisms is limited by rapid chelationimmobilization when applied on fallow soil; glyphosate in root exudates, or from decaying weed tissues or RR plants, contacts these organisms in their most active ecological habitat throughout the rhizosphere. It is not uncommon to see Fe, Mn, Ni, and Zn deficiencies intensify and show in soils that were once considered fully sufficient for these nutrients. Increasing the supply and availability of Co, Cu, Fe, Mg, Mn, Ni, and Zn have reduced some of the deleterious effects of glyphosate on these organisms and increased crop yields. immobilize nutrients such as K in microbial sinks to deny availability for plants, and deny access to soil nutrients through pathogenic activity. Plant pathogens stimulated by glyphosate (table 3) include ubiquitous bacterial and fungal root, crown, and stalk rotting fungi; vascular colonizingorganisms that disrupt nutrient transport to cause wilt and die-back; and root nibblers that impair access or uptake of soil nutrients. TABLE 3. Some plant pathogens stimulated by glyphosate. F. oxysporum f.sp. (canola) Phytophthora spp. F. oxysporum f.sp. glycines Pythium spp. Shikimate pathway (secondary metabolism) unless soilborne pathogens are also present. It is the increased susceptibility to soilborne pathogens, and increased virulence of the pathogens, that actually kills the plants after applying glyphosate. Disease resistance in plants is manifest through various active and passive physiological mechanisms requiring micronutrients. Those metabolic pathways producing secondary anti-microbial compounds (phytoalexins, flavenoids, etc. ), pathogen inhibiting amino acids and peptides, hormones involved in cicatrisation (walling off pathogens), callusing, and disease escape mechanisms can all be compromised by glyphosate chelation of micronutrient co-factors critical for enzyme function. Genetic modification of plants for glyphosate tolerance partially restores Shikimate pathway function to provide a selective herbicidal effect. compromises plant defenses and increases pathogenesis to increase the severity of many abiotic (bark cracking, nutrient deficiencies) as well as infectious diseases of both RR and non-RR plants in the crop production system (table 4). Many of these diseases are referred to as ‘emerging’ or reemerging’ diseases because they rarely caused economic losses in the past, or were effectively controlled through management practices. shown that bark cracking, sunscald, and winter-kill of trees and perennial ornamentals is caused by glyphosate used for under-story weed control, and that glyphosate can accumulate for 8-10 years in perennial plants. This accumulation of glyphosate can be from the inadvertent uptake of glyphosate from contact with bark (drift) or by root uptake from glyphosate in weed root exudates in soil. Severe glyphosate damage to trees adjacent to stumps of cut trees treated with glyphosate (to prevent sprouting in an effort to eradicate citrus greening or CVC) can occur through root translocation and exudation several years after tree removal. where glyphosate is used for weed control prior to cereal planting. A related disease of cereals, and the cause of rice blast (Magnaporthe grisea), is becoming very severe in Brazil and is especially severe when wheat follows a RR crop in the rotation. Like take-all and Fusarium root rot, this soilborne pathogen also infects wheat and barley roots, and is a concern for U.S. cereal production. everywhere; however, Fusarium head scab (FHB) has generally been a serious disease of wheat and barley only in warm temperate regions of the U.S. With the extensive use of glyphosate, it is now of epidemic proportions and prevalent throughout most of the cereal producing areas of North America. Canadian research has shown that the application of glyphosate one or more times in the three years previous to planting wheat was the most important agronomic factor associated with high FHB in wheat, with a 75 % increase in FHB for all crops and a 122 % increase for crops under minimum-till. The most severe FHB occurs where a RR crop precedes wheat in the rotation. Glyphosate altered plant physiology (carbon and nitrogen metabolism) increasing susceptibility of wheat and barley to FHB and increased toxin production, is also associated with a transient tolerance of wheat and soybeans to rust. however, the high concentrations of mycotoxin in grain are not always associated with Fusarium infection of kernels. Quite often overlooked is the increase in root and crown rot by FHB. subsequent translocation to stems, chaff and grain. Caution has been expressed in using straw and chaff as bedding for pigs or roughage for cattle because of mycotoxin levels that far exceeded clinically significant levels for infertility and toxicity. This also poses a health and safety concern for grain entering the food chain for humans. The list of diseases affected by glyphosate (see reference No. 18) is increasing as growers and pathologists recognize the causeeffect relationship. (esp. Mn and Zn but also Cu, Fe, Ni). soil by adding appropriate elements for chelation with the residual glyphosate. are inhibited by residual glyphosate in soil and glyphosate in root exudates. MEETING NUTRIENT SUFFICIENCY: Extensive research has shown that increased levels and availability of micronutrients such as Mn, Zn, Cu, Fe, Ni, etc can compensate for reduced nutrient efficiency and the inefficiency of RR crops. This need may not be manifest in high fertility or nutrient toxic soils for quite a few years after moving to a monochemical strategy. The timing for correcting micronutrient deficiencies is generally more critical for cereal plants (barley, corn, wheat) than for legumes in order to prevent irreversible yield and/or quality loss. Nutrient sufficiency levels from soil, and tissue analysis adequate for non-GM crops may need to be increased for RR crops to be at full physiological sufficiency. materials, it may be best to apply some micronutrients 1-2 weeks after glyphosate is applied to RR crops. with glyphosate might provide an efficient means to overcome deficiencies in low fertility soils, as well as mitigate the reduced physiological efficiency inherent with the glyphosate-tolerant gene and glyphosate immobilization of essential nutrients in the plant. glyphosate applied later, has been beneficial even though excess nutrient applied at this time may be immobilized by glyphosate from root exudates and not available for subsequent plant uptake. Micronutrients such as Mn are not efficiently broadcast applied to soil for plant uptake because of microbial immobilization to non-available oxidized Mn, but could be applied in a band or to seed or foliage. sufficient. Gypsum applied in the seed row has shown some promise for detoxifying glyphosate from root exudates since Ca is a good chelator with glyphosate (one of the reasons that ammonium sulfate is recommended in spray solutions with hard water is to prevent chelation with Ca and Mg which would inhibit herbicidal activity). Although bioremediation of accumulating glyphosate in soil may be possible in the future, initial degradation products of glyphosate are toxic to both RR and non-RR plants. This is an area that needs greater effort since the application of phosphorus fertilizers can desorb immobilized glyphosate to be toxic to plants through root uptake. the performance of some RR crops, and further improvements are possible in this area. that have been used to promote plant growth, with the most recognized being legume inoculants (Rhizobia, Bradyrhizobia species). Continued use of glyphosate in a cereal-legume rotation has greatly reduced the population of these organisms in soil so that annual inoculation of legume seed is frequently recommended. important in nutrient cycles may be possible if the remediating organism is also glyphosatetolerant and capable of over coming the soils natural biological buffering capacity. This would be especially important for nitrogen-fixing, mycorrhizae, and mineral reducing organisms, but will be of limited benefit unless the introduced organisms are also tolerant of glyphosate. Modification of the soil biological environment through tillage, crop sequence, or other cultural management practices might also be a viable way to stimulate the desired soil biological activity. INCREASING PLANT RESISTANCE TO STRESS AND ROOT INFECTING PATHOGENS: Maintaining plant health is a basic requirement for crop yield and quality. 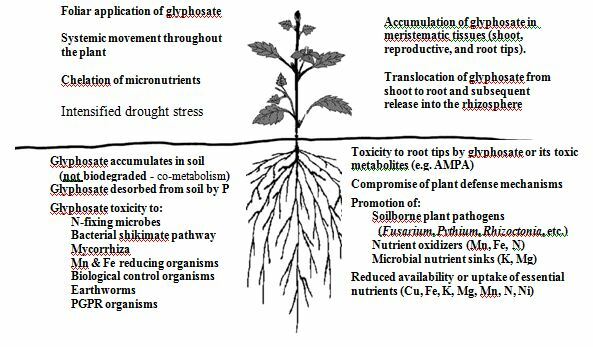 Plant tolerance to stress and many pathogens is dependent on a full sufficiency of micronutrients to maintain physiological processes mediated through the Shikimate or other pathways that are compromised in a glyphosate environment. Sequential application(s) of specific micronutrients (esp. Mn, Zn) may be required to compensate for those nutrients physiologically lost through glyphosate chelation. Breeding for increased nutrient efficiency and disease resistance will be an important contributor to this objective. 1. Arregui, M.C., Lenardon, A., Sanchez, D., Maitre, M.I., Scotta, R., and Enrique, S. 2003. Monitoring glyphosate residues in transgenic glyphosate-resistant soybean. Pest Manag. Sci. glyphosate application on seed iron and root ferric (III) reductase in soybean cultivars. J. 4. Bott, S., Tesfamariam, T., Candan, H., Cakmak, I., Roemheld, V., and Neumann, G. 2008.
soybean. European J. Agron. 31:114-119.
early canopy establishment in bread wheat. EECCO poster, Ottawa, Canada. 7. Datnoff, L.E., Elmer, W.H., and Huber, D.M. 2007. Mineral Nutrition and Plant Disease. APS Press, St. Paul, MN, 278 pages.